Vegetarian diets can easily meet all the recommendations for nutrients. The key is to consume a variety of foods and the right amount of foods to meet your calorie needs. Nutrients that vegetarians may need to focus on include protein, iron, calcium, zinc, and vitamin B12. Protein has many important functions in the body and is essential for growth and maintenance. Protein needs can easily be met by eating a variety of plant-based foods. Combining different protein sources in the same meal is not necessary. Sources of protein for vegetarians and vegans include beans, nuts, nut butters, peas, and soy products (tofu, tempeh, veggie burgers). Iron functions primarily as a carrier of oxygen in the blood. Iron sources for vegetarians and vegans include iron-fortified breakfast cereals, spinach, kidney beans, black-eyed peas, lentils, turnip greens, molasses, whole wheat breads, peas, and some dried fruits (dried apricots, prunes, raisins). Calcium is used for building bones and teeth and in maintaining bone strength. Sources of calcium for vegetarians and vegans include calcium-fortified soymilk, calcium-fortified breakfast cereals and orange juice, tofu made with calcium sulfate, and some dark-green leafy vegetables (collard greens, turnip greens, bok choy, mustard greens). Calcium supplements are another potential source. Zinc is necessary for many biochemical reactions and also helps the immune system function properly. Sources of zinc for vegetarians and vegans include many types of beans (white beans, kidney beans, and chickpeas), zinc-fortified breakfast cereals, wheat germ, and pumpkin seeds. Vitamin B12 is found in animal products and some fortified foods. Sources of vitamin B12 for vegetarians include fortified breakfast cereals, soymilk, veggie burgers, and nutritional yeast. B12 supplements are another potential source. - Build meals around protein sources that are naturally low in fat, such as beans, lentils, and rice. Don't overload meals with high-fat foods to replace the meat. - Calcium-fortified soymilk provides calcium in amounts similar to milk. It is usually low in fat and does not contain cholesterol. A variety of vegetarian products look (and may taste) like their non-vegetarian counterparts, but are usually lower in saturated fat and contain no cholesterol. - For breakfast, try soy-based sausage patties or links. - Rather than hamburgers, try veggie burgers. A variety of kinds are available, made with soy beans, vegetables, and/or rice. - Add vegetarian meat substitutes to soups and stews to boost protein without adding saturated fat or cholesterol. These include tempeh (cultured soybeans with a chewy texture), tofu, or wheat gluten (seitan). - For barbecues, try veggie burgers, soy hot dogs, marinated tofu or tempeh, and veggie kabobs. 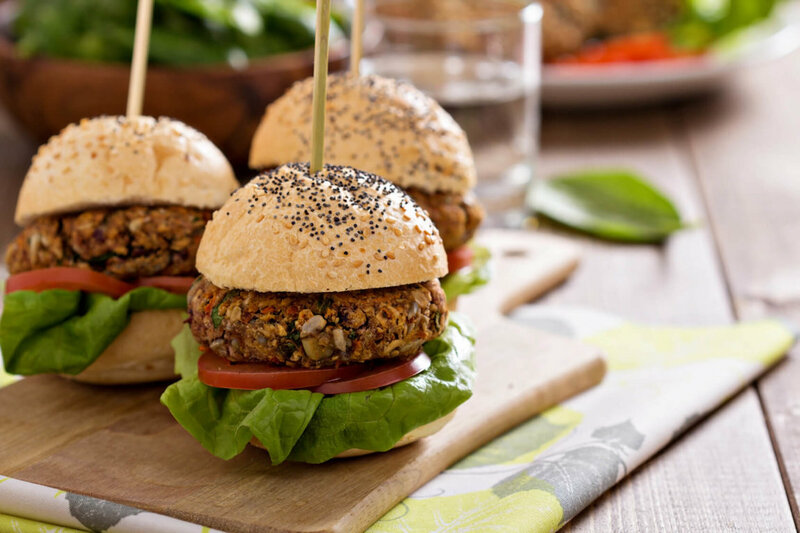 - Make bean burgers, lentil burgers, or pita halves with falafel (spicy ground chick pea patties). - Some restaurants offer soy options (texturized vegetable protein) as a substitute for meat, and soy cheese as a substitute for regular cheese. - Most restaurants can accommodate vegetarian modifications to menu items by substituting meatless sauces, omitting meat from stir-fries, and adding vegetables or pasta in place of meat. These substitutions are more likely to be available at restaurants that make food to order. - Many Asian and Indian restaurants offer a varied selection of vegetarian dishes.